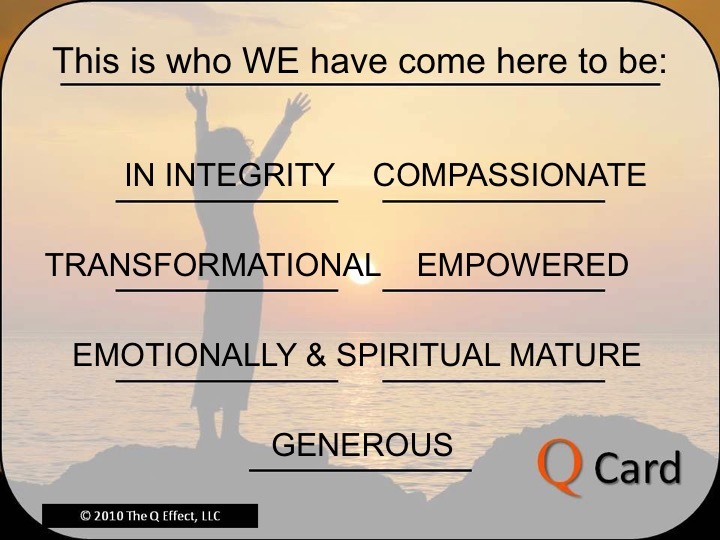 Last Sunday during my Center Update I shared the Q Card / Shadow Card of Unity Spiritual Center. And together, as a congregation, we affirmed: "Please have compassion for us when we are being fearful, not enough, a victim, distrusting, not important, or powerless, because THIS is who we have come here to be: in integrity, compassionate, transformational, empowered, emotionally and spiritual mature, and generous!" Our Genogram Activity (see previous blog post) experience was a pivotal event in the ministry's journey insofar as the community took ownership of its story and the limiting beliefs it took on because of challenging circumstances. Every church has challenging circumstances and most church leaders, as well as community members take on limiting beliefs in their struggle to get to a better place. There is a growing interest in 2nd Tier ministry as a possible antidote to the current decline of the minister-centric model of ministry. Shadow work and shadow integration by ministry leaders is integral to sustainable 2nd Tier ministry practice. In other words, you can't evolve your ministry practice until the minister and ministry leaders evolve. Your ministry leaders cannot embody 2nd Tier ministry practices without these same leaders involved and engaged in shadow integration. 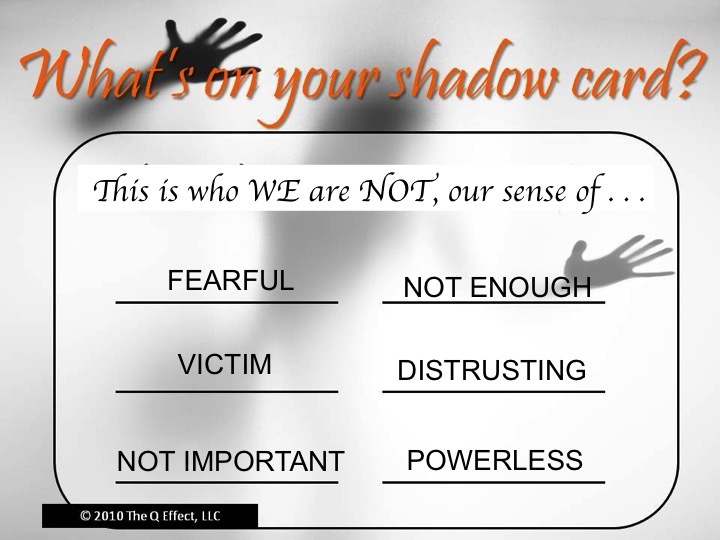 What's more, unless the methodology or system of shadow work becomes a cultural norm, the practice of shadow integration will not reach a tipping point within the organization and community. To be clear, not all shadow work leads to shadow integration. 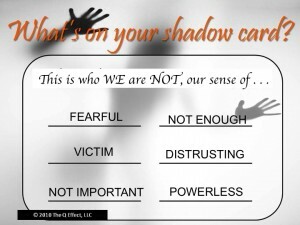 Not all shadow work systems translate into the integration of organizational issues. From time to time I hear colleagues say that their ministries are engaged in shadow work. So I wonder if they are creating a culture-wide tool for their entire congregation to practice. If not, if the shadow work being promoted is more "in theory only" rather than a spiritual practice within the ministry it won't affect cultural transformation. Popular books on the shadow and the importance of shadow integration are helpful guides for understanding the importance of reconnecting with the orphaned parts of ourselves, yet my guess is that they do not lend themselves to a community-wide application or practice, in part, because shadow work is more associated with therapy than it is as a spiritual practice or an organizational tool. Ministers are not necessarily trained to facilitate shadow work in others as this lives beyond the scope of ministerial training. Even if the minister has a depth of shadow integration themselves, this still does not translate into the competence for the facilitation of others much less applying these principles and processes to organizational shadow integration. 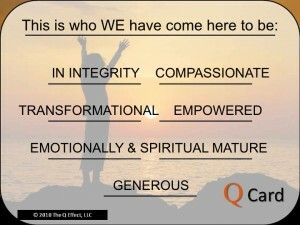 The Q Effect, LLC, has developed the Q Process™as a program of shadow integration for both the individual and the organization. Rather than therapy, this heart-centered, self-directed, science-based program is "aware-apy" designed to help participants uncover and integrate shadow beliefs that may have been blocking their spiritual growth. This clearing brings forth appreciation and compassion, leading to a greater capacity for living life firmly connected to New Thought's foundational principle of One Power. The Q Process™ was first introduced in 2009 as a key component of the Transformation Experience, a three-year pilot program to field-test the mission-centric model of ministry. This program was facilitated by trained professional consultants (Unity and CSL). The results of this program have been documented and are available online. Dr. Rima Bonario is Jane's and my Q Effect business partner and co-creator of the Q Process™. She studied the impact of the Q Process™ as a part of her doctoral research. Click here to read a synopsis of her study. Two key outcomes were used to judge the success of this tool in establishing a new, more integrated and resilient sense of self: increased self-compassion and decreased anxiety. The study hypothesized that the Q Process™would, in fact, produce statistically significant increases in self-compassion and statistically significant decreases in anxiety in adults. 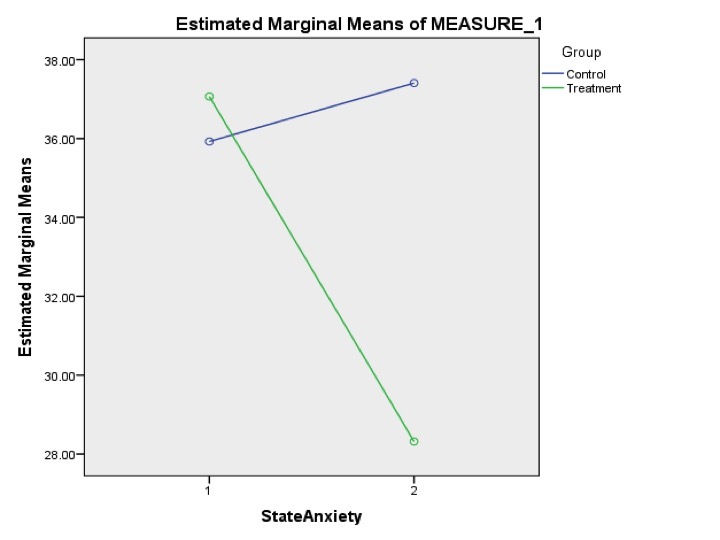 The graphs below visually depict the difference in pre- and post-test scoring for the treatment and control groups for State Anxiety (how much anxiety one feels in the moment) and Trait Anxiety (how much anxiety one generally feels). 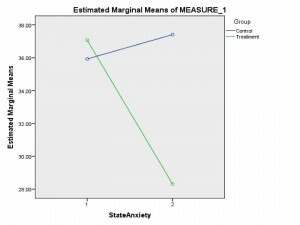 Generally speaking, the higher an individual's T-anxiety score is the more likely they will experience S-anxiety. How anxious do you feel in this moment? How anxious do you feel in general? 19.7% reduction in trait anxiety.anxiety. While a person's S-anxiety could fluctuate from day to day depending upon what is happening, it is very rare for T-anxiety to change, much less fluctuate based on external pressures. Rima's study shows that the Q Process™ demonstrated a statistically significant reduction in T-anxiety in just 21 days! While a person's S-anxiety could fluctuate from day to day depending upon what is happening, it is very rare for T-anxiety to change, much less fluctuate based on external pressures. Rima's study shows that the Q Process™ demonstrated a statistically significant reduction in T-anxiety in just 21 days! Further, there was a statistically significant increase in self-compassion. 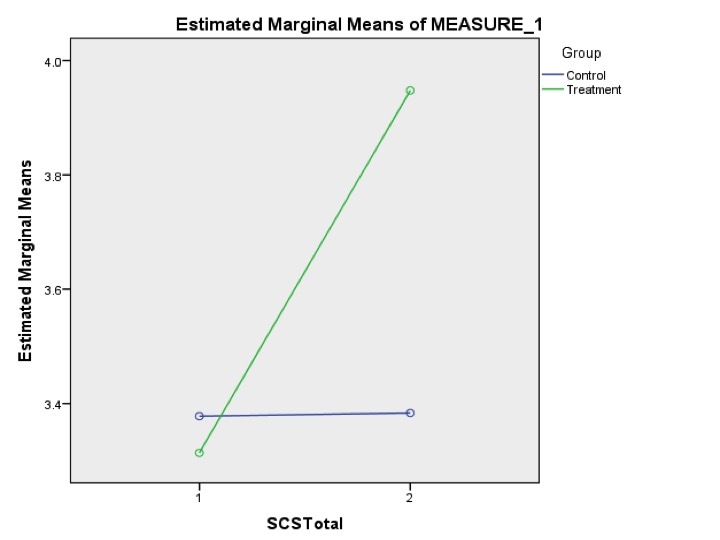 The graph visually depicts the difference in pre- and post-test scoring for the treatment and control groups for the total self-compassion score. 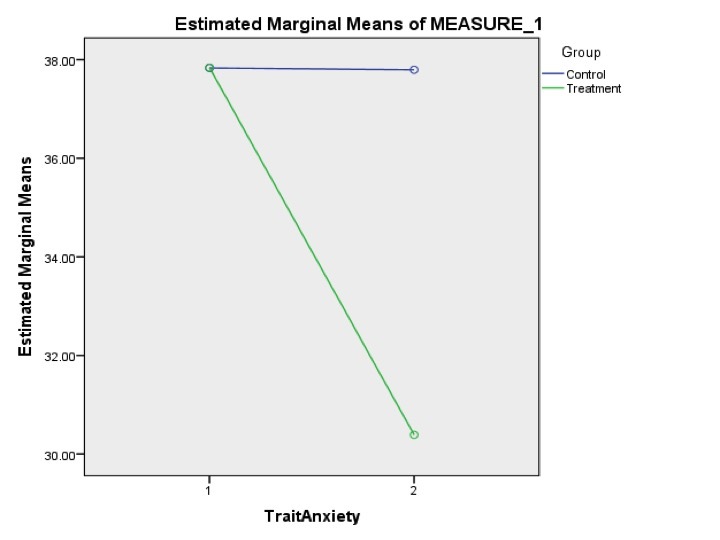 These results clearly show that the Q Process™ positively and significantly impacted participants' self-reported state and trait anxiety as well as self-compassion. 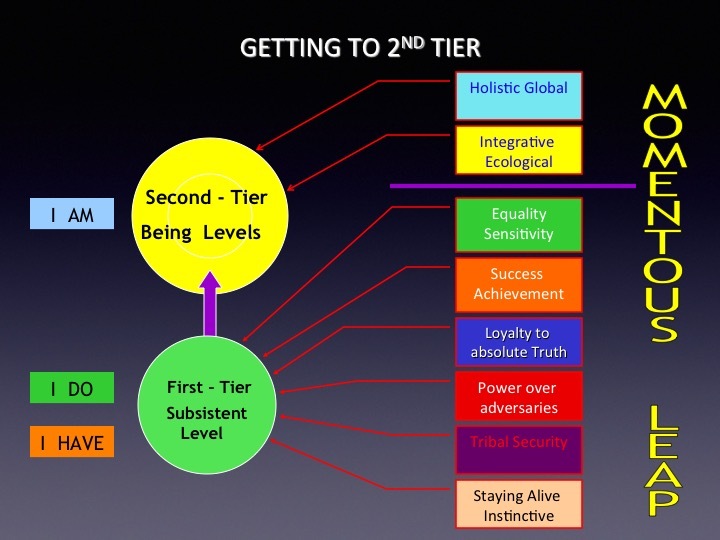 In addition to these findings, Rima has linked the Q Process™ to aiding in the increase of Spiritual Intelligence (SQ21). Click here to view a video presentation of her research and results. The video below is a shorter, edited version. 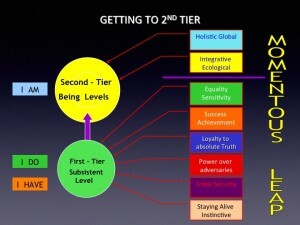 The Q Process™ is foundational to Unity Spiritual Center's movement toward a 2nd tier ministry practice. At the recent completion of our third Art & Practice / Q Process™ program, participants were invited to share how they were impacted by the process. It is difficult to convey the depth of connection and care that people feel towards each other through an increase in Spirit-led, heart-centered living. The saying made famous in the Avatar movie: I see you hints at the most palpable takeaway--people are truly seeing one another. It is so inspiring and exciting to behold what emerges when we, as a community, really begin to live our spiritual principles! It is truly an art and a practice. Popular books on the shadow and the importance of shadow integration are helpful guides for understanding the importance of reconnecting with the orphaned parts of ourselves, yet my guess is that they do not lend themselves to a community-wide application or practice, in part, because shadow work is more associated with therapy than it is as a spiritual practice or an organizational tool.